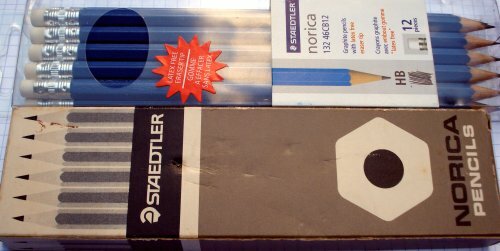 The Norica is one of Staedtler’s second tier brands. Apart from this page at Staedtler Thailand (which shows yet another Norica), I don’t find it officially mentioned by Staedtler. We have here the (modern) 132 46 from Thailand, and the vintage 130 41 from Great Britain. Comments from a previous post indicate that there are even more variants out there! In Canada, the modern Norica is sold at “big box” type stores. From a distance, one thinks it might be a Mars Lumograph (which one must presume is the intent), but it has a much lower price. In HB, it has a crunchy, compacting dark lead, and is much higher quality than I would expect from a discount pencil. The Great Britain Norica, in a B grade, offers a fainter lead than the Norica’s HB. It is also a nice pencil. Comparing the two pencils reveals some interesting design contrasts. I think I prefer the older pencil. That’s very interesting, especially the comparison side by side! The graphics on the old cardboard box is great – simple and elegant. The lettering of the old Norica looks a little garbled. Does the quality vary? And: Does the older Norica have an eraser as well? The quality of the lettering and imprint does seem to vary – the outlined “B” in particular shows inconsistencies. I also note that the “1”s in “130 41” are not the same – the first is definitely the digit “1”, but the second seems to be the same as the “I” in “NORICA”. The older Norica has no cap or eraser. One other fact: the older Noricas are imprinted in the “left-handed” style, text written from cap to point. Coming in late, put wanted to add more info on these pencils as info on the web is somewhat limited (and no, I don’t work for them ;)). As of this date, they are currently listed on the Staedtler North America web site (http://www.staedtler.ca/norica_na.Staedtler), among other Staedtler sites. They are fairly widely available in Canada (all three major office supply stores–Staples, Office Depot & Grand & Toy–carry them, among other places). But less so in the USA. Perhaps because the Staedler’s North American offices are now located in Canada. Two grades are available, HB & 2H. They come pre-sharpened; mostly in plastic packs as in the above blog post, but also now on the official website there seems to be a cardboard package available. Have that unique dark-blue paint; not the same as a Mars Lumograph, but depending on your eye, a more “luxurious” color than standard pencil-yellow. “Break-resistant thanks to super-bonded lead”; likely the same lead used in the Noris Club and other second-tier Staedtler pencils. Have a “latex-free white vinyl eraser tip”. Its not the same formulation as a genuine Mars Plastic eraser, though; it does not erase as cleanly as a Plastic on paper. But still better/easier on paper than most pink erasers. Nice weight, heavier than low cost pencils. Unknown wood, almost certainly not cedar. Basswood? Still made in Thailand as of this date. The graphic near the eraser has changed as of this date, though. Instead of the pictured “HB2”, it now looks like “HB 2” with the 2 having a square silver background with the number in the blue pencil paint raised off it. From what I have seen in stores in Canada, they appear to be priced at an identical price point and compete directly with the two other widely available “higher quality” pencils: the Dixon Ticonderoga & PaperMate Mirado. Which means more expensive than low end pencils: house brands, Dixon Economiser (Canada)/Dixon No. 2 (USA) & PaperMate Canadiana (Canada)/PaperMate American (USA). Not anywhere close to the Mars Lumograph, though. About $2.70 CND average for a pack of 12. Finally, the quality control on the packs seems good; no problems seen on any of several packs purchased so far. Which is more than I can say for recent Mirado packs. So looks like a decent choice if you want to use woodcase pencils for basic writing needs. And/or you want some of that Staedtler pencil “mystique” at an affordable price. Zidomo, thanks for the very informative contribution! Just want to let everyone know that recently I just bought a pack of staedtler norica pencils and they are really bad. The lead tip is very weak and continues to break with the slightest pressure. Apart from the bad quality, they are more expensive then other brands. I highly recommend that you don’t buy this brand.